This page contains safety guidelines designed to avoid the risk of serious injury from spinning boat propellers. 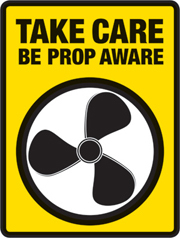 Boat propellers pose a risk that can too easily be ignored because they are 'out of sight and out of mind'. A strike from a propeller can cause serious injury or even death. Propeller-related injuries are preventable and the skipper should take precautions to ensure the safety of all on board. Skippers should consider the area around the propeller as a 'hazard zone', being vigilant to ensure that no part of any person comes near a spinning propeller. This is particularly important for people involved in tow sports, like water-skiing and wakeboarding and where powerboats are used near swimmers or children, such as sailing schools or surf clubs. Wear a kill switch lanyard whenever driving a vessel under power. A kill switch lanyard is attached to the arm, or securely to your clothing or lifejacket, and stops the engine when pulled out. 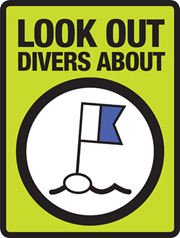 Make sure you keep a good lookout for snorkellers, spearfishers, divers and swimmers. Be especially alert when you see the Alpha flag, which means divers, snorkellers or spearfishers are in the water nearby. If you are diving or snorkelling from a vessel you must display this flag and it is strongly recommended that you use the Alpha flag at all times while snorkelling, diving and ocean swimming. Attach a fluorescent yellow/green flag below Alpha for increased visibility.